The son of a carpenter in the town of Värnamo in South Sweden, it seemed inevitable that Bruno Mathsson would follow in his father's footsteps and take a great interest in furniture design, in particular – chairs and their form, function, and design. 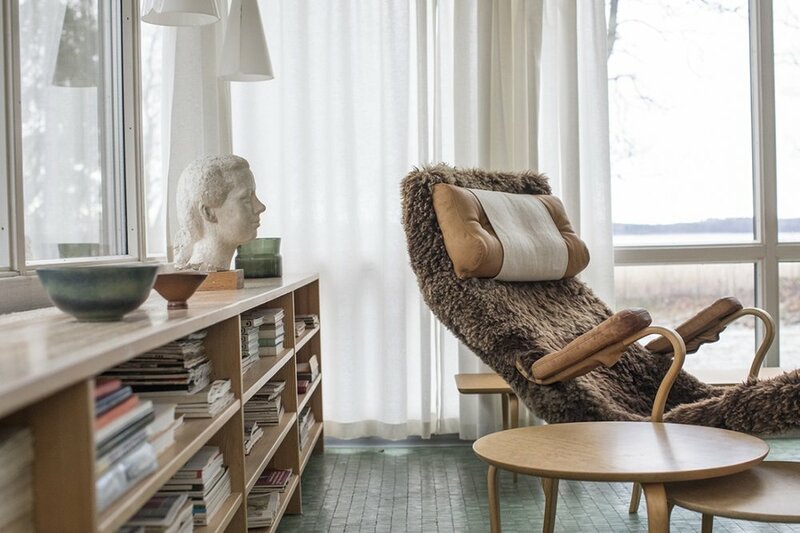 Today, Mathsson is known as one of Sweden's most famous furniture designers and architects, and his iconic works include the Grasshopper, Eva Chair, and classic Swivel chair, all of which are on display in the glasshouse he built next door to his childhood home. During a recent visit to this Bruno Mathsson Center, we learned that it was following a long stay in America that Mathsson was inspired to build glasshouses; another one of which happens to be Södra Kull in Tånnö – the home of Bruno and his wife Karin – of which we gained exclusive access. As though preserved in time, it contains everything as though the couple have just popped out for the day and contains a lot of Mathsson's work. Vinyl records sit next to a stunning recliner chair that looks out onto the adjacent lake. Bowls and other kitsch crockery sit inside beautifully designed cupboards, which pop open with a gentle push. Family photographs are dotted about the space with favourite books neatly stacked on floor to ceiling shelves. You can even see where Mathsson would've sat and worked to explore new ideas and draw concepts for new furniture and architecture. It's a fascinating insight into the life and work of Sweden's most celebrated designers. "The house bears the stamp of being close to nature, the simple and functional, and Bruno Mathsson's love for the light," explains Visit Småland, who organised the guided tour with design journalist Hedvig Hedqvist. She passionately explained how Mathsson realised in the 1930s that modern times required a new way of sitting. His functional approach to sitting, working and socialising eventually took the world by storm and changed the way we sit forever. Touring his home in Tånnö, we got a glimpse of his passion for great design, as every little feature was lovingly crafted and put together by him. You can book your own tour of the Bruno Mathsson centre in Värnamo via Visit Värnamo. Special thanks to Visit Sweden and Hedvig Hedqvist for the tour. And thanks to photographer Tina Stafrén for the beautiful images.